TropicalPros.com is one of the largest and most reputable tropical floral suppliers in Hawaii. Until recently, our floral products have been exclusively available to only a select number of wholesale florists. At TropicalPros.com we now ship world-class floral gifts directly to you. 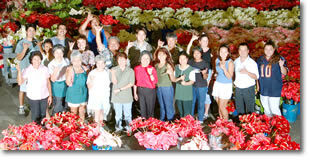 TropicalPros.com operates one of largest and most modern flower facilities in the Hawaii! We take great pride in shipping you the finest, freshest, tropical flowers. We guarantee it! Our TropicalPros.com flower staff has a combined 300+ years of farming, processing and shipping experience. We are not small or part-time. At TropicalPros.com flowers are our only business. We annually ship millions of tropical flowers from our own flower farms or from our team of 65 independent producers. Combined we grow Hawaii’s finest flowers on over 200 acres. Rest assured your order will be shipped promptly. We guarantee it. TropicalPros.com is proud of the reputation we've earned in the flower industry. "Pacific Business News, First Hawaiian Bank and accounting firm "Coopers and Lybrand" selected us among the 40 fastest growing companies in Hawaii! This honor is a result of the extraordinary effort, dedication to quality and conscientious effort by our entire flower gift staff. See for yourself what our Hawaii, national and international customers know. You too will be satisfied with our quality and service. All of us at TropicalPros.com look forward to sharing our "Aloha" with you. We will ship you with the freshest and finest tropical flowers available. Your orders will be professionally picked, processed and shipped to your loved ones. This is our promise. We unconditionally guarantee it! Mahalo - Thank-you!